2019 Cressi Dive Computer – Entry Level Leonardo or Giotto? / 2019 Cressi Dive Computer – Entry Level Leonardo or Giotto? 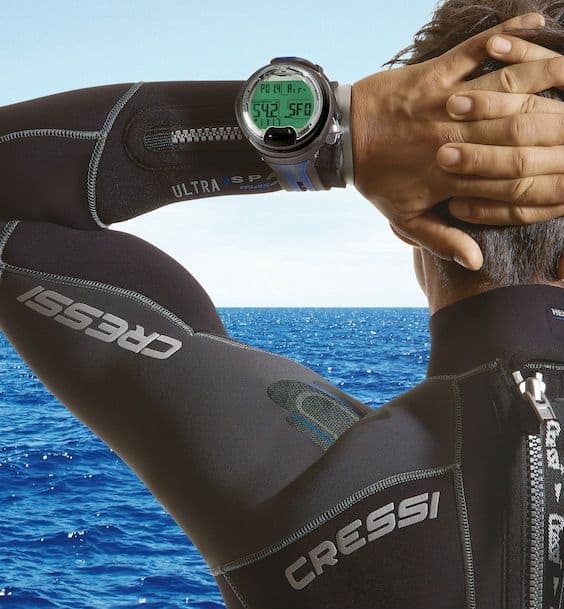 The Cressi brand has a long history of providing quality products for water sports enthusiasts. Cressi is a good brand with high standards when it comes to safety, performance and reliability. 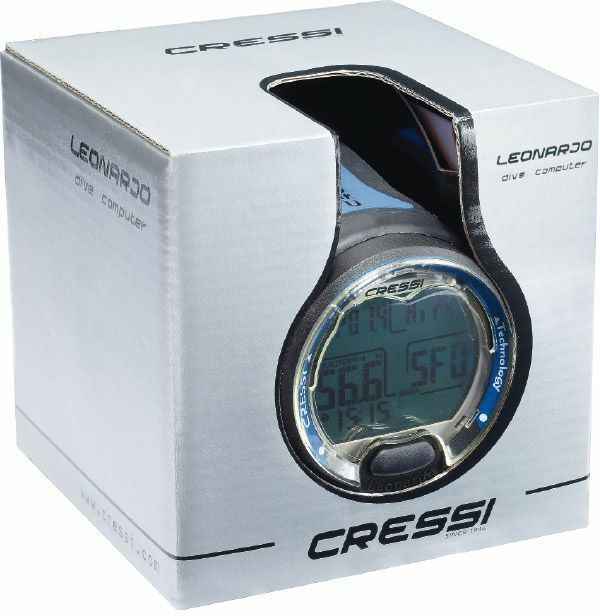 The Cressi Leonardo is a sleek looking dive computer with a durable design. The Leonardo diving computer is a great choice for entry level and recreational divers. 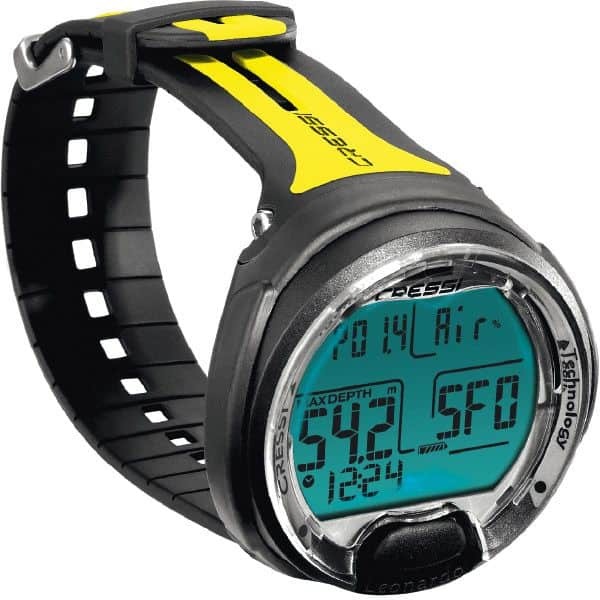 If you already know the Cressi Leonardo dive computer is for you, click the button below to see the current price plus any savings available on Amazon. 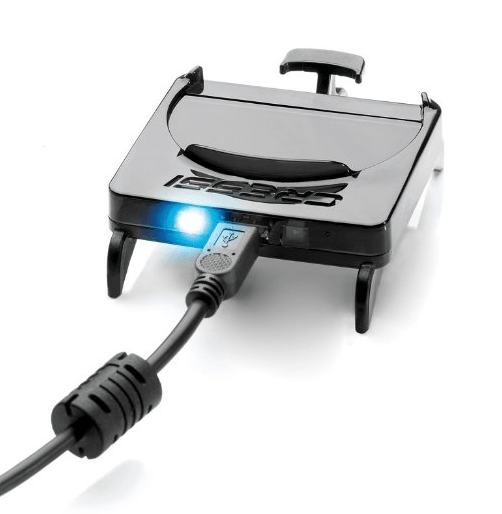 Why Choose a Cressi Dive Computer? How many Dive modes does the Leonardo have? What Features and Functions does the Leonardo have? 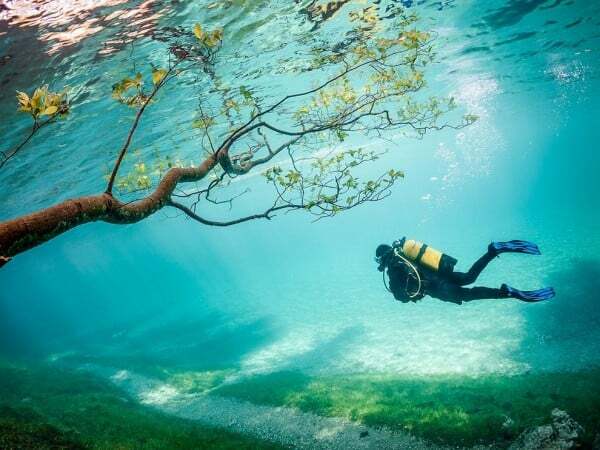 Considering diving at different altitudes? Cressi Leonardo Dive Alarms - Are they adjustable? What about the Dive Planner and Logbook Memory? Does this come with a downloadable diving Data Log option? Can you change the Leonardo battery yourself? Which Algorithm does the Cressi Leonardo use? Who's this Dive Computer NOT for? Cressi Leonardo versus Giotto - What extras do you get? How many Dive modes does the Cressi Leonardo have? The Leonardo has 3 operating modes, Air, Nitrox (between 21% to 50%), and Gauge. Gauge mode is an excellent bottom timer with accurate profile sampling and bookmarking functions. Dive time is shown in minutes and seconds. The Gauge Mode will display accurate bottom times and decompression limits. Buying a dive computer with Gauge mode means this can be used as a backup computer if you expand on your training and decide to get into technical diving later on. The wrist mounted Leonardo is 2.63 inches (67 mm) across with a thickness of 1.06 inches (27 mm). It weighs 4.76 ounces (135 grams). Cressi Leonardo's menus are accessible with a single button. Push to scroll through menu options and use ‘push and hold’ to access and set menu options. The menu button on the Leonardo is nice and big making it easy to press even with gloves on. There is no ‘Back’ button option, so if you go past your menu selection, you have to ‘go around’ again to get back to it. The display is clear and easy to read underwater. The Leonardo has an edge-to-edge, high-definition LCD screen. It has big over-sized digits which make it easy to read the vital information during the dive. The Cressi Leonardo is water-activated. It starts the DIVE AIR program as soon as you go below 4 feet (1.2 meters). The Surface Interval begins to start it's countdown as soon as you're back up at 4 feet. If you dive below this level in less than 2 minutes, the Leonardo adds this data into the previous dive. After a full 2 minute Surface Interval, the next dive is recorded as a new one. This is a much shorter minimum Surface Interval than it's main competitors. The Leonardo comes with a backlight for poor light conditions. The backlight will last a few seconds before switching itself off automatically. Basic settings are easy to change to suit your personal preference. Imperial and metric settings can be reset to display feet or meters, ºF or ºC. The clock display can be set to read as either 12-hour or 24-hour time. The Leonardo also comes with a calendar, date and temperature display. All of these dive computers have the basic functionality to keep you safe while diving. Their differences are listed in the comparison table below. There are some notable differences between these entry level and recreational diving computers. Whenever diving above an altitude of 1,000 feet (300 meters), Altitude settings need to be adjusted on dive computers. You must give yourself time to acclimatize to a new altitude and lower atmospheric pressure before going on a dive. It's generally recommended you wait at least 3 hours to regain equilibrium before diving after changing altitudes. 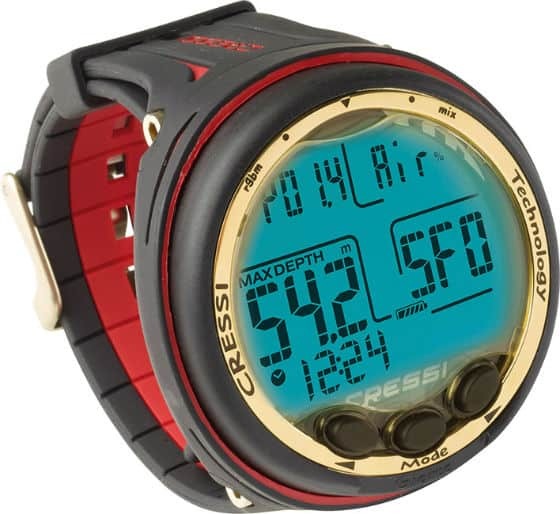 The Cressi Leonardo's altitude is adjustable up to 12,100 feet (3,700 meters). The dive alarms on the Leonardo are audible and quite distinctive. They are also adjustable and can be turned off. There's an Ascent Rate Alarm (10 meters per minute), Deep Stop and Countdown Timer. The Leonardo will signal a SAFETY STOP for each dive greater than 32 feet. It also displays a STOP icon to help with the 3 minute stop that's recommended be taken between 20 feet and 10 feet. The STOP icon appears with the time in minutes and the depth (shown in meters or feet depending on your preference). The Cressi Leonardo also has a Deep Stop alarm. Whether or not you need to include Deep Stops in your Dive Plan remains a controversial issue. Given that the Leonardo is an entry level dive computer, you shouldn't need to worry about planning for Deep Stops. 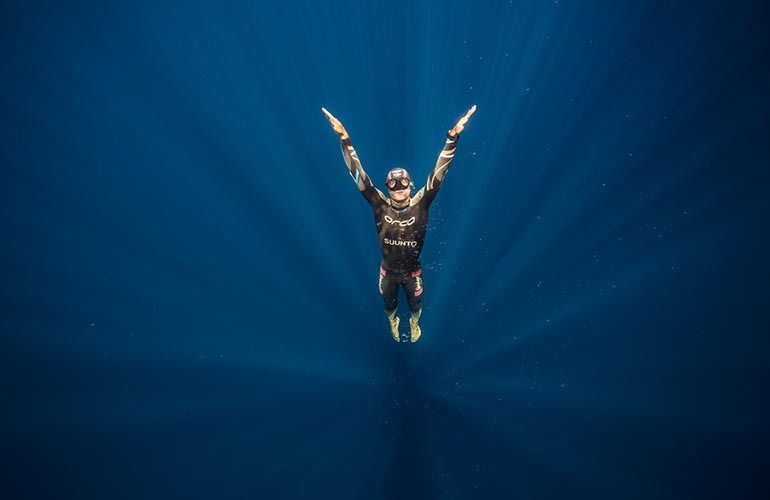 Deep Stops may come into play when you're diving below 65 feet (20 meters), for long periods of time. The Leonardo has a dive memory logbook for DIVE AIR, DIVE NITROX and GAUGE dives. The Logbook setting has a memory capacity of around 70 hours (or approximately 60 dives) worth of dive time. Data is recorded every 20 seconds. The Leonardo's pre-dive planning sequence will give adjusted dive times based on residual nitrogen accumulation. It will also include safe decompression calculations if you're doing multiple dives over multiple days. Your nitrogen absorption and release are continually processed. The short answer is no, this is an optional extra. You need to buy the download kit separately. The download kit allows you to download your Dive Log to either a PC or Mac. You can then view the dive profile information complete with graphs. This makes it easy to review critical dive profile information. The dive information provided includes depth, decompression status, maximum depth, bottom time, descent and ascent rates. You can see the ambient temperatures, surface intervals and all warning points during a dive. Being able to view and analyze this information does help improve your diving ability. Package deals are available so that you can buy the kit together with the computer. This Kit includes a stand. The download Kit when purchased on its own costs around the $100 mark. The Software can be downloaded directly from the Cressi web site on their Downloads page under PC Interface. Another great open-source option is Subsurface. The Leonardo takes a 3-volt CR2430 battery which is user replaceable. The battery life indicator icon is easy to view. When the time comes, the replacement battery pack costs under $23. If you're not confident enough to change this yourself, then any supplier will be able to do this for you. The average battery life is around 2 years based on 50 dives per year. 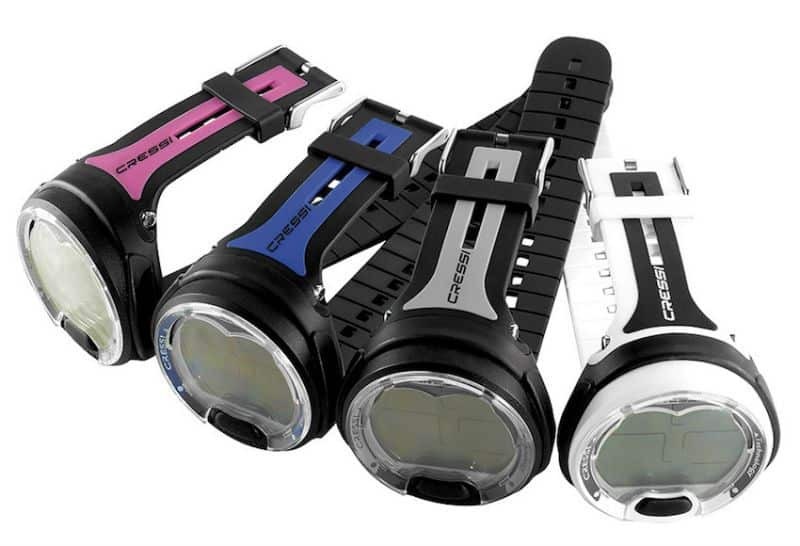 Different factors will affect its longevity including the length of your dives and how often you use the back light. Diving in cold water will decrease the length of the battery life. The Cressi Leonardo uses the Haldane and Wienke RGBM (Reduced Gradient Bubble Model) algorithm which is known for its conservatism. You're able to adjust the level of conservatism based on your personal preference, the level of fitness and your diving style. The Cressi Leonardo doesn't have wireless air integration or a built in compass. Experienced Scuba divers and Freedivers after more advanced functions may be interested in Suunto's D6i, D4i Novo the D4F. Shearwater also has the Teric with a Free Diving Mode. The Cressi Leonardo is not designed for commercial or professional use. This dive computer is NOT recommended for diving beyond no decompression limits. If you go below the no-decompression limits, an audible alarm is issued and the STOP icon with DECO will be displayed. The Leonardo will provide specific information to help you with surfacing. If you're planning on expanding your training later to include deco diving, then take a look at some of our reviews of mid-level diving computers. The Cressi Giotto is the big brother to the Cressi Leonardo and if you have a few extra dollars to spare and want to stick with the Cressi brand, then it may be worth investing in the Giotto. 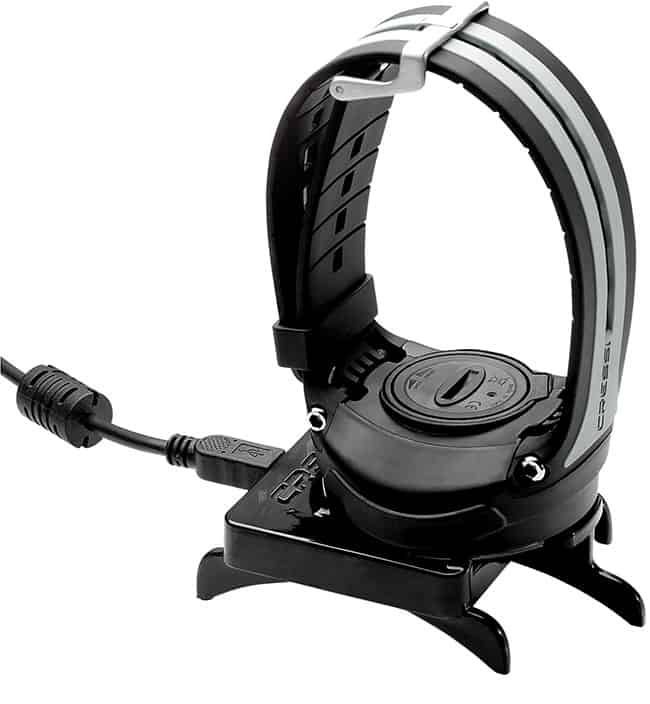 The Cressi Giotto is priced around $100 above the Cressi Leonardo dive computer. It has all the same features as the Leonardo but comes with the ability to do decompression calculations. The Cressi Giotto has a 3 button menu as opposed to the one menu button interface of the Leonardo. Many people find the 3 button style menu much easier to navigate. The Giotto can also handle two different hyper-oxygenated mixtures, which can be selected during the dive. 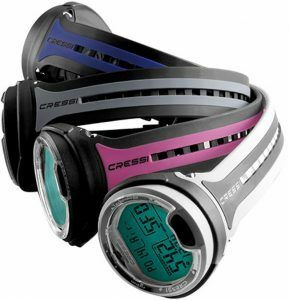 Cressi has a solid reputation as a strong and dependable brand. The Cressi Leonardo is one of the most popular entry level dive computers. This has all the functions needed by Entry-level and Recreational Scuba divers at a really good price. The Leonardo is reliable and a well built dive computer at a very affordable price. If you're keen to download your log onto your computer, look out for package deals that will save you money when buying the Download Kit at the same time as the Cressi Leonardo Dive Computer. Since taking up Scuba diving in 1983, Terry Moore has been diving at some of the world's greatest dive spots, and to date has over 3,000 dives under his belt. 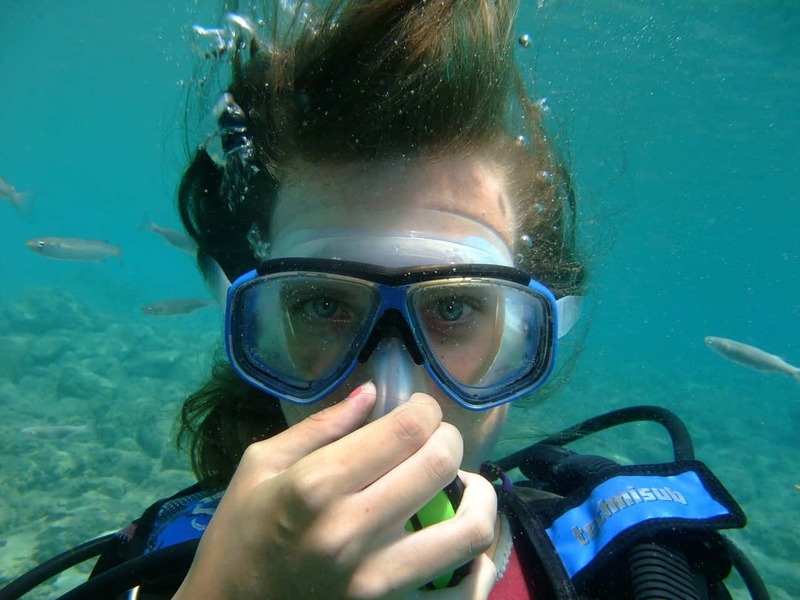 As well as being a PADI Diving Instructor, Terry has worked in the offshore live-aboard diving industry teaching Underwater Photography and other specialty courses. Terry has dived off the island of Tortola in the British Virgin Islands, Australia, Papua New Guinea, Fiji, Palau, Truk Lagoon, Belize C.A. and numerous places throughout the Caribbean. He's pretty much dived wherever there was water deep enough to dive in. Interested in reading our other Dive Computer Reviews? Which is the Best Entry Level Dive Computer for Beginners? 2019 Suunto Vyper Novo & Zoop Novo – What’s the difference? Suunto Zoop Novo – Still the Best Entry Level Dive Computer in 2019? 2019 Suunto D4i and D4i Novo – What are the differences? 2019 Mares Puck Pro vs Puck Pro Plus. Does it have Bluetooth? 2019 Seiko Automatic SKX007K – The most affordable divers watch! Which is the best Motorcycle Airbag Vest and Jacket in 2019? The best value for my money. The Cressi Giotto is the best value for my money. Spend the little extra for those great features. You won’t regret it. Great review Sharon. Thank you.